One of the important things in your car is to keep your car’s tires properly inflated for it to get the optimum performance it can give. With improper pressure your tires can wear faster and fuel waste. This also can hurt the vehicle’s handling that may cause serious accidents. Tire monitoring should do once a month for a secure drive. You should check the tires pressure especially during cold season because this is the times the tire pressure often to fall in cooler weather. 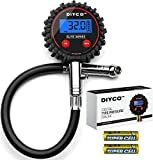 You may want to know the best tire pressure gauge to use in your car, motorcycle and other vehicle that has tires on it. And also know the important things to know about the tires of your car. Price – you should buy a product that is worth its price. Find a tire pressure gauge that has a price that matches its features and qualities. Durable and versatile– find a tire pressure gauge that can be used by many types of vehicle and strong that can be reuse for a long term. Brand – the brand can ensure you the quality of a product. Maybe sit will be expensive but it is durable and made from strong material. The AstroAI Digital Tire Pressure Gauge can help you maintain the correct tire pressure and reduce tire wear. Because of a good tire pressure it can help to extend tire life. The Backlit LCD display and Lighted nozzle are built for visibility during night or dimmed areas. The accurate and easy-to-read digits will help you easily measure your vehicle’s tire pressure. It has measurement ranges of 0-150 PSI, 0-10 BAR, 0-1000 KPA, and 0-10 Kg/cm. its minimum increment is 0.5 PSI. This uses battery that is 3V Lithium Coin Cell and has a display of 8.3 x 4 inches LCD display. It can work in 23-122 Fahrenheit. Some reviews said that it does not have accurate reading sometimes. Its ergonomic design makes it friendly and easy to hold by the user, this can also help to have an accurate measurement of the tire pressure. Some says it I made by cheap materials and easy to destroy but it will depend on you on how much will you care for the device. But all in all this is worth its price. 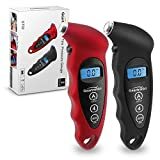 The Geartronics Digital Tire Gauge is an accurate and very easy to use tire gauge for your car, motorcycle or even for your bicycle. Tire pressure gauge plays a vital role for your driving time because it can keep your driving safe. And this high quality gauge is also an important tool to prevent you from having accidents and could improve the quality of the life of the tire. It has a backlight LED and light nozzle that shows you the exact reading data clearly even though it is at night or any dark place. The Geartronics Digital Tire Pressure Gauge 150 PSI will be an easy help when you need to test tire pressure. Will be automatically turned off after 30s. This tire pressure gauge was very small that makes it easy to carry and be brought wherever you like. It is also easy to store and you can understand the instructions easily. But you need to cycle all four ranges it you want to change the range that makes it really time consuming and not efficient to use. The AstroAI Digital Tire Inflator Gauge can make the filling of your tires extremely easy when using a compressor. You can simple check the tire while it is filling by air instead of filling a tire, check the pressure, adjusting, checking, and repeating over and over again. This will help you to save time. Its inflation range is 0-250 PSI and has an accuracy of ±1%. This can also display with a resolution of 0.1 PSI its display type is a backlit LCD. The measurement units that is used in this tire pressure gauge are PSI, KPA, Bar and Kgf/cm2. 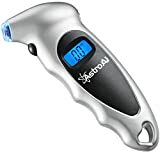 The AstroAI Digital Tire Inflator Gauge has a compatibility of NPT air compressor connector. This gives a good reading but the 1 percent of accuracy can be classified as an overstatement since the truth is it’s not that fast. But this is a good product and it is very portable and easy to carry. The clamp on the valve also helps you to keep your reading smooth and sure. The digital provides the most accurate measurement. It has a large 1.5″ LCD Display with LED Backlit. Quickly take pressure reading during the day or low light conditions. To ready it for what may happen. This digital processor eliminates all mechanical moving parts. The G-shock and vibration resistant can be used. Drops, shakes, and bounces will not affect gauge accuracy. A must have for vehicles with TPMS sensors and warning light on the dash. The LCD display will help you to see it even though it is really hot and sometimes if is cold outside. It has a 360 degree ball that rotating air chuck and air bleed valve assembly are made from nickel plated brass that makes it really tough and durable. This is made from heavy duty material that makes it really durable and strong. Made from nickel plated brass and rubber boot that gives great physical strength to the tire pressure gauge. This can be used on SUV, trucks, RV even on off road vehicles. But this cannot be used if you are measuring below 20 PSI. The Accutire MS-4021B digital tire pressure gauge provides easy to read LCD display where the pressure readings from 5-150 PSI in 0.5-pound increments can be seen. It is also ergonomically designed with an angled head and a rubber coated for it to be easy grip. It has heavy-duty construction that will easily withstand shifting around in your bag or toolbox. Many of us can easily forget things to do especially when we are in a hurry, this tire pressure gauge is equipped with an automatic shut off system to help you save the power of its battery. As you can see it is made from heavy duty materials. It also has rugged design so that it can last for a long run. It has angled head and rubber coated handle for it to be easy to carry and hold. It is also has an automatic shut off to prevent it from deflation. It has very heavy duty material but the plastic parts are very vulnerable. You can use this but always use it with care. But in terms of performance this is accurate and easy to use. This has also good design that makes taking the tire pressure easy. The Ionox Digital Tire Pressure Gauge has an extremely durable metal body that makes it heavy duty and strong. It is sensitive +/-0.5 PSI accuracy. This Ionox digital tire gauge promises to be your go-to gauge whenever an easy and accurate tire pressure gauge. It measures high and low pressure in four pressure scales up to 150PSI, 1000kPA, 10 Bar and 10 kg/cm2. The lowest measure it can take is 0.5 PSI. The Ionox tire pressure gauge can provides instant, accurate and very easy to read measurements. This is a good and very compact product. It also has a good physical design and it is very useful in the dark. The different scales made it very versatile. It reads very quick and accurate. It is also easy to operate but to do another reading you must wait few seconds for it to show. The Slime Digital Tire Gauge with Lighted Tip enables you to maintain the proper pressure in the tires of your vehicles. This can help you in minimizing tread wear and increasing gas mileage. This can also help you in improving handling and control of your car. This digital gauge has an easy-to-read LED display that has an automatic shut off, a reset button, and low to high PSI, KPA and BAR. This has rubber on the side so that it will not slip off your hands while measuring the tire pressure of your car. It also has LCD monitor where you can see the accurate measurement. This convenient and it is better than those traditional tire pressure gauge. This can work on cars and even in bikes. It is easy to use and it gives accurate readings, the backlit also makes it good for night use. This is also handy and easy to store, can be put on your tool box or bag without hassle. Its performance is tested, certified accurate, and calibrated to ANSI B40.1 International Accuracy Standards (±2-3%) this helps in ensuring precise tire pressure readings without relying on batteries and other parts of the product. This can make you feel solid in the hand and it is built from premium heavy duty components shielded by a rugged gear-style protective guard. 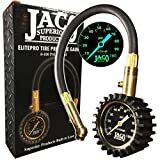 This features a flexible no-leak air hose making checking tire pressure easier than using other kind of tire pressure gauge. As you can see this is not a digital tire pressure gauge but it is made from heavy duty material that makes it really strong and can last long. It has a 360 degree swivel chuck that allows you to access to the tire valve from any angle you like. This product is really expensive but the performance is worth its price. It is also made from heavy duty materials that makes it very strong and can last for a long run. The brass fittings rotate very well and it does not have any leak. It will also help you to decrease the air in your tire if it has too much air that needed. This has a full size digital led screen, where you can read data clearly even at night that makes it very convenience. This uses metal screw nut inside hose that makes the connection sturdier and safer. It has a shockproof rubber around the head that helps it to be protected, it only need 2 AAA batteries as its power source. This has a 4 measurement units namely the Psi, Bar, kg/cm2 and the Kpa. It is also 15 seconds automatic and the measurement unit’s memory automatic shut-down to save battery and has a low power alarm. Geartronics Digital Tire Pressure Gauge is very handy and compact. Even though it has a cheap price but the performance is really great. It also has replaceable two AAA batteries that makes it good for a long period of usage. And because it is lightweight it is easy to carry and it can make your measuring easy. This provides you accurate reading with 4 settings, the nozzle of it is easily forms a seal with the valve stem on schrader valves this helps to have giving quick and accurate readings in 0.5 increments. It is also classified as a versatile product because you can use this for cars, trucks, motorcycles, bicycles but not compatible with presta stems. This tire pressure gauge is easy to use you can just press “ON/UNIT/OFF” button to turn on the tool, select the range of measurement, and it automatically shut off in 40 seconds that helps you to save the power. Is also has non-slip texture makes it easy to hold onto and the ergonomic design is both suitable for both genders. Not compatible with presta stems. This product is worth its price.it has great performance and it is very versatile and portable. This also make fairly accurate readings that can be measure in 4 settings. This can be used by female or males because it is easy to understand and be familiar using it. – Know what the appropriate tire pressure for your car is. You can read it on the cars manual or in the tire information card. This will also help fuel economy. – Always check your tires because the tire pressure can drop during cold weather. While the pressure can increase when its summer or it has warm weather. Tire pressure gauge is important for you to check your tires pressure anywhere when you need it. Checking your tire pressure is very important because if you over fill it or under fill your tires it can cause problems that can lead to accidents. Now you have learn the different brands and types of a tire pressure gauge. You also read about the difference of one brand to another brand. They may have different specialty that depends on their brand. Some are good at being handy and smooth, and some are heavy duty and very technical. You also learned that tires are essential to our car and that it is responsible for fuel economy, controls and safety of a car. Finding the best tire pressure gauge become really easy, just remember to consider the things you want to be included on the tire pressure that you are going to buy to be successful and happy about your purchase.